Swimming vs. road work/running for boxers – a better option or a therapeutic option? Swimming is a great aerobic enhancer and surpasses the benefits of running as far as endurance and lung capacity are concerned. It opens up the alveoli and increases the feel good factor. It brings up the overall fitness level and tones the whole body of a boxer relaxing every muscle as well during warm down in the water. Swimming is a low impact activity and injury in the pool is extremely rare (slipping in the shower is another story). The old school of thought used to believe swimming developed the wrong back and shoulder muscles and affected the range of motion for boxers. The same school preached that free weights were poison for the boxing body. Those prejudices have been dispelled today and swimming has emerged as an indispensable part of a boxer’s fitness regimen as it also remedies the impact of weight training among other health gains. Excessive swimming can lead to shoulder pain but it happens after years of daily over-training – only professional swimmers get that problem. Swimming is great for a boxer with a leg injury. Road work is much more natural than swimming but it takes a tall on the knees and ankles. A tendon or meniscus problem is debilitating at any time and a nightmare during training camp. An ankle sprain or a knee twist will rule out running but swimming would not only be a good substitute, it could be prescribed as therapy in such cases. Floyd Mayweather uploaded a video of him swimming as part of his preparation for May 2. He has not been known to swim so far, at least not as a part of his cardiovascular training sessions. 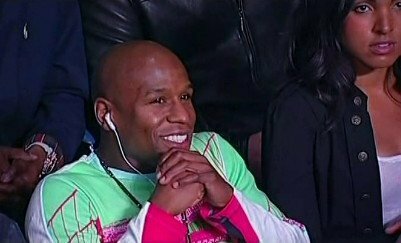 I am not implying Mayweather has a leg complaint, he would not conceal a game-changing detail like that and he would not risk fighting with any kind of injury. However it could have something to do with Freddy Roach’s opinion that “his legs are little shot” and his conditioning specialist could be addressing such issues. Swimming works the muscles while conserving the joints and tendons, it’s an elixir for distressed limbs. Mayweather’s footwork has faded in his latest fights and has perhaps contributed to his new found militancy against Canelo and Maidana. The implication is that his legs can no longer win the race and take him out of trouble so he has to fight his way out. Whatever the reason for his new aerobic infatuation, it is a great variation and a wise training supplement. His conditioning coach certainly knows the score but I’d like to hear the opinion of Mayweather Sr. about swimming, unedited. We were informed about Mayweather’s overpriced catering, certainly nutrition is of paramount importance. Swimming will be much lighter on his pocket and very effective. If examples are necessary, Wladimir Klitschko and Vasyl Lomachenko among others swim a lot and have made swimming an integral part of their endurance and agility programs. Treading water and shadow boxing under water can be useful fun as well. Let’s hope swimming adds to the quality of the bout with Pacman, at these prices it’d better be up there where it belongs. You are here: Home / Boxing News / Swimming vs. road work/running for boxers – a better option or a therapeutic option?